"The Closer" on its way out? Victoria is only 80 miles from Seattle, but for that short distance, it can be a pain to get to. Damn water. Now that the GF has her passport, we headed up there a few days ago. There are several choices for the journey. You can take the Victoria Clipper from downtown Seattle if you don't want to bring a car and want to spend almost $300 (for two people). 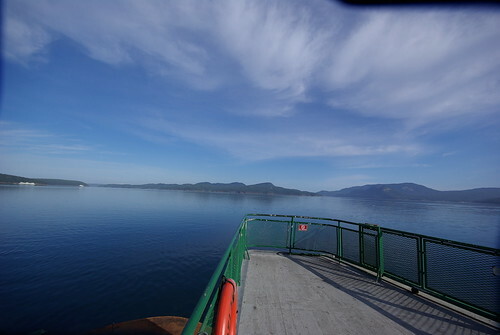 You can drive 2.5-3 hours to Vancouver, BC and catch one of a number of different ferry options. 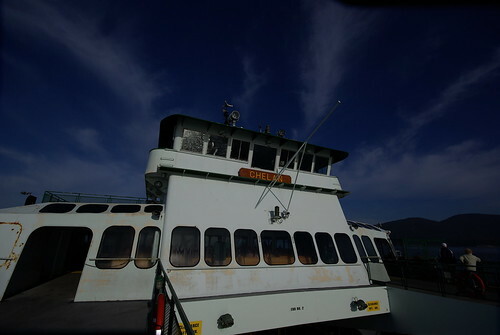 You can take a ferry out to the Olympic Peninsula and then catch another ferry from Port Townsend to Victoria. Or you can do what we did. I think we found the best combination of convenience, cost, and time. 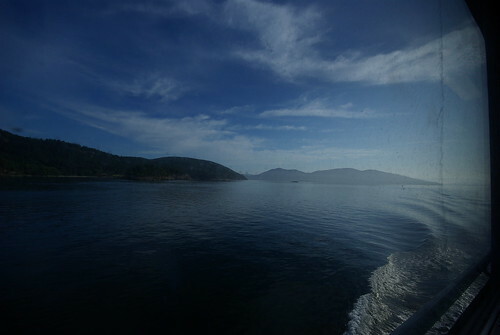 We left Seattle at 4:30 AM and drove about an hour to Anacortes. We left plenty of time in case something went wrong, but nothing did. We got to the ferry terminal at about 5:45 AM and waited in line for the 8:15 AM sailing. The ferry ride took just over 2 hours and let us off in Sydney, BC, about 20 minutes from our hotel in downtown Victoria. The great thing about the ferry ride, besides being beautiful is that once we were on the boat I didn't have to do anything, like make sure my car stayed in it's lane. I could just relax and take some pictures. And it's a heck of a lot more comfortable than flying anywhere in coach. The roundtrip cost for the ferry was about $130 for two people plus the car. And Canadian customs/immigration was a breeze. 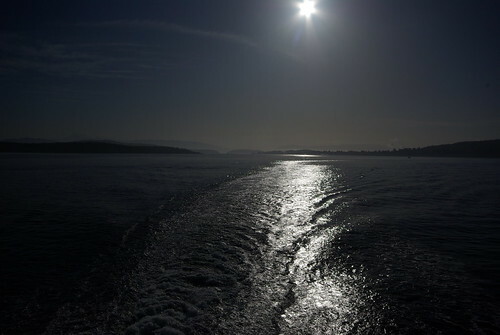 You can see more pictures from the ferry trip here. In the news recently, there has been increased discussion of Free Flight as a way to modernize air traffic control. But that's only one of the innovations being worked on. In this Seattle Times article, reporter discuss the FAA's Next Generation project for landing planes. Currently, the way I navigate in a new city, using GPS, is more technologically advanced than the way planes land at most airports. Most planes take long, gradual routes to reach a run way. The take steps down in altitude, rather than descending gradually, and they have to wait until some person miles away tells them to take that next step. The Next Generation project, however, ties the planes autopilot into GPS navigation, combined with a preplanned approach route that lowers fuel consumption, exhaust generation, time, and impact on the surrounding community. It sounds like a winner. Alaska Airlines recently tested this solution at SEA. "This is a perfect place to do this," said Mike Adams, the pilot in command of the August test flight. "Boeing is here. Alaska has a completely equipped fleet. Everybody is trained. We are so ready, we can't stand it any more." Alaska projects reduced overflight noise for 750,000 Seattle-area residents, along with annual savings at the airport of 2.1 million gallons of fuel and 25,000 tons of carbon-dioxide emissions. "There is nobody who loses here," Adams said. The airline began using the new navigation system in 1996 to enable its planes to fly safely into Juneau, Alaska, approaching along a narrow sea channel surrounded by rugged mountains. Other airlines have since applied it in other areas, including Australia and Tibet. The big challenge appears to be the bureaucracy of the FAA. The FAA's Hickey, onboard the test flight, said it's too early to estimate when the agency might approve Alaska Airlines' Sea-Tac procedures for use by all airlines. "NextGen is a long, long process of transformation from the current system to a future system that is far more efficient," Hickey said. "It's not a big bang. It's going to be a bunch of incremental approaches." The NextGen plan stretches through 2025. Hickey said the Obama administration is looking at accelerating parts of it. As someone who spend 90,000 miles a year sitting on airplanes, I certainly value safety, and I don't want anyone cutting corners, but more than a decade to fully implement something like this just doesn't make sense to me. Even the optimistic assessment from Alaska has it taking 5 years to implement at SEA. "I think you could see us doing this with passengers in late-night arrivals in one or two years," he said. "And in daytime mainstream arrivals, potentially within five years." Integrating these changes with airlines that have the advanced equipment that Alaska does could be challenging, but years? Alaska has already been essentially doing this in Juneau since 1996. The airlines are struggling now. Air Traffic Control is now facing a serious shortage of new controllers since all the new ones hired in the early 80s (following the disastrous PATCO strike) are now at retirement age. Let's speed this up, save fuel, save money, reduce the ATC workload, and reduce the burden on airport communities. I've heard from Canadians for several years now about how awesome Tim Horton's is. I'm in Victoria, BC, for a couple days (and having an awesome time), and was really looking forward to my first Tim Horton's visit. I gotta say, though, it didn't quite live up to my (probably too high) expectations. I will say the donuts were good. They make a solid, tasty doughnut. And two of the three doughnuts we got were the ones we ordered. The other one was apparently from the neighboring bin. Still tasty, but emblematic of challenges The GF and I faced while ordering. While they got the doughnut order 66% right, coffee proved to be more of a challenge. I know there is good coffee outside Seattle. I'm not enough of a snob to say that it doesn't exist (especially since we're only about 80 miles away). It's not like real pizza (which doesn't exist outside NYC). And I know some people have trouble ordering at Starbucks. With all the options it can get confusing, and most people don't order something that is listed exactly on the menu. When you specify a menu item by it's exact name, though, you typically get it. And you don't confuse the cashier. When I asked for an XL Cappuccino which is listed on the Tim Horton's menu, the cashier had no idea what I meant. She asked, "What kind?" There are no different kinds listed on the board above her head -- no "choose your option/kind." The other cashier helped her out. The craziest I got for customizing it was to ask for 5-shots. Most places that sell espresso-based beverages know that means 5-shots of espresso. Apparently here, she though that meant 5-pumps of sugar. And that raises a few other questions. First, are more people asked for an espresso beverage with extra sugar than ask for it with extra espresso? Second, is sugar normally measured in pumps? The GF had even more trouble. Hanging above the aisles were banners advertising a small, iced beverage of some sort. She ordered that. The cashier responded that Horton's doesn't have "small" and just offers a "medium." Some may argue that Starbucks does the same thing by offering a "Tall" as the smallest option and how that is the same problem Horton's has. There are two reasons why that's not true. First, the "Tall" isn't the small option at Starbucks. The "Short" is. Nearly all beverages are available as "Shorts." Second, the "Shorts" do not appear on the menu. That's the key to the issue -- the "small" was a featured, advertised item. It appeared on the in store signage and on the menu board behind the cashier. So she took the order for the medium iced beverage and promptly prepared the hot version. I'm guessing (and hoping) this was the cashier's fist day at work. I'm sure at some point I'll give Tim Horton's another try, at least for doughnuts, but I'm in no rush. It looks like there are plenty of independent coffee shops in the area where I might have better luck. Is this typical of Tim Horton's or did I just run into one with some unusual staffing challenges? The harvest is really coming in now. I've already pulled in 10-15 pounds of tomatoes, and can probably double that in the next few weeks. I've been lucky there. The GF used both the leaves and bulb in a dinner. I guess I'll try growing more of them next year. The GF and I are planning a two-night trip to Victoria, BC. I've gotten some great suggestions about what to do through Twitter. Are there any can't miss sights you can suggest, besides Butchart Gardens (a main goal for the trip)? The plan is to leave Seattle at about 4:30 AM to catch an 8:15 ferry from Anacortes to Sydney, BC. I'm looking forward to the 3+ hour boat ride. After Dark is the story of 7 hours in the lives of two sisters -- Mari and Eri. It takes place one night, between 11:56 PM and 6:52 AM. It explores the narrow lines that separates the "respectable world" from the underworld, and the real world from the "other" world. If you know me, or you surmise by the various time stamps of my assorted Internet missives, you know I am a fan of the night. The amount of light and the temperature aren't the only things separating night from day. The night itself brings out different people and opens up the mind to possibilities that would get singed out of existence by the sun's rays. So perhaps I have an affinity for this book by virtue of the simple fact that it takes us through one of those powerful nights that has a magic all its own. Unlike most Murakami novels, this one is not told by a lonely 30-something guy who's career is not going well and who has (or recently lost) a cat. It's told in third person, from the perspective of an omniscient Director of Cinematography. For most of the novel, we follow Mari and her adventures that start when we zoom in on her sitting in a Denny's. On her table is a coffee cup. And an ashtray. Next to the ashtray, a navy blue baseball cap with a Boston Red Sox "B." It might be a little too large for her head. A brown leather shoulder bag rests on the seat next to her. 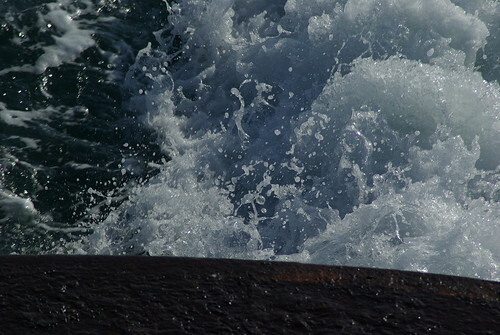 It bulges as if its contents had been thrown in on the spur of the moment. She reaches out at regular intervals and brings the coffee cup to her mouth, but she doesn't appear to be enjoying the flavor. She drinks because she has a cup of coffee in front of her: that is her role as a customer. At odd moments, she puts a cigarette between her lips and lights it with a plastic lighter. She narrows her eyes, releases an easy puff of smoke into the air, puts the cigarette into the ashtray, and then, as if to soothe an approaching headache, she strokes her temples with her fingertips. One thing I like about Murakami is the detail he brings to his characters. The physical descriptions get their clarity not from the adjectives describing their subjects, but from the actions the subjects take, like stuffing a purse in a rush or the periodic grabbing of a coffee cup. These little stories tell us more about the characters than any number of descriptive words could. Mari is a student who has studied the Chinese language. She soon meets Takahashi, a musician who once dated her sister, when he wanders into the Denny's. His right cheek bears an eye-catching scar. It is short and deep, as if the flesh has been gouged out by something sharp. Nothing else about him stands out. He is a very ordinary young man with the air of a nice—but not very clever—stray mutt. He sits down to chat with her, and she listens without enthusiasm. They meet up a few more times over the course of the evening. Being an amateur jazz musician is not how he planned to make his living. He studied to become a lawyer, but decided against that career. 'As I sat in court, though, and listened to the testimonies of the witnesses and the speeches of the prosecutors and the arguments of the defense attorneys and the statements of the defendants, I became a lot less sure of myself. In other words, I started seeing it like this: that there really was no such thing as a wall separating their world from mine. Or if there was such a wall, it was probably a flimsy one made of papier-mache. The second I leaned on it, I'd probably fall right through and end up on the other side. Or maybe it's that the other side has already managed to sneak its way inside of us, and we just haven't noticed. That's how I started to feel. It's hard to put into words. He knew that a career in law was not for him. And this theme of the thin wall runs throughout the novel. For Takahashi, it means he has trouble seeing a clear line between "the good guys" and "the bad guys. "Either is a role anyone could find themselves in easily. Mari has little experience with the the darker side of modern society, but that changes as we go through the novel. The manager of love hotel seeks her out later in that Denny's after learning of her existence from Takahashi. A customer brutally beat and robbed a prostitute in the love hotel, and the manager needs Mari to help translate for the victim. Mari spends time with the prostitute, the manager, and other staff members of the hotel -- all people whose lives have not turned out as expected and find themselves living on the other side of the respectability line. They are on the seamier side of Japanese life. From here, we get a look at the world of human trafficking and violence. We don't see the whole thing through Mari's eyes. We jump into other characters' views -- always in third person, however. That thin veil isn't the only one in the novel. Mari's sister, Eri, is going through her own line crossing episode. When we first meet Eri she is sleeping soundly in a room. She has been sleeping for months. It is profound supernatural sleep. Eventually, she disappers from our world, and crossed the line into the "other" world. It's a world on the other side of a TV screen. A TV that somehow runs even when not plugged in. Our third person perspective let's us see what happens, and once she is on the other side, we get to follow her. And so we decide to transport ourselves to the other side of the screen. It's not that difficult once we make up our mind. All we have to do is separate from the flesh, leave all substance behind, and allow ourselves to become a conceptual point of view devoid of mass. With that accomplished, we can pass through any wall, leap over any abyss. Which is exactly what we do. We let ourselves become a pure single point and pass through the TV screen separating the two worlds, moving from this side to the other. Sleep is a powerful thing in Murakami's world -- a lot happens to characters while they sleep. The difference between the waking world and the sleeping world is an arbitrary one at best. Other novels featured characters who recharged others as they slept, complex dream worlds, and sleep prostitutes who don't provide sexual services, but instead lay with clients while they sleep, never nodding off themselves. While Mari spends the whole night awake, Eri spends much of it asleep. Except when she's on the other side, and then Murakmi treats us to this rich description of Eri waking up. Before long there is movement in Eri's face again—a reflexive twitching of the flesh of one cheek, as if to chase away a tiny fly that has just alighted there. Then her right eyelid flutters minutely. Waves of thought are stirring. In a twilight comer of her consciousness, one tiny fragment and another tiny fragment call out wordlessly to each other, their spreading ripples intermingling. The process takes place before our eyes. A unit of thought begins to form this way. Then it links with another unit that has been made in another region, and the fundamental system of self-awareness takes shape. In other words, she is moving, step by step, toward wakefulness. The pace of her awakening may be maddeningly slow, but it never moves backward. The system exhibits occasional disorientation, but it moves steadily forward, step by step. The intervals of time needed between one movement and the next gradually contract. Muscle movements at first are limited to the area of the face, but in time they spread to the rest of the body. At one point a shoulder rises gently, and a small white hand appears from beneath the quilt. The left hand. It awakens one step ahead of the right. In their new temporality, the fingers thaw and relax and begin to move awkwardly in search of something. Eventually they move atop the bedcover as small, independent creatures, coming to rest against the slender throat, as if Eri is groping uncertainly for the meaning of her own flesh. That level of action-oriented description again climbs to the surface in Murakami's writing. Every minute detail is critical to creating a level of amazement in what is one of the most mundane daily tasks we do -- wake up. I'm sure someone has already gotten their Masters degree in literature by examining the meaning of sleep in Murakami novels, but if not, I may choose to do that someday, decades in the future if I decide I want an English degree (or would that be more appropriate to a Japanese degree?). I've read enough Murakami now to know that there are rarely answers in his books. The plot lines will not be neatly wrapped up, and we won't alway know what happened, why it happened, or what it means. That still frustrates me somewhat, but it didn't bother me too much with this book. While cleaner answers would have been nice, I no longer expect them. When reading a Murakami novel it helps to just stay with the flow of the words and drink up their sweet tasty nectar. Spend time with the characters who are fascinating people. But don't count on clarity at the end because it won't be there. Even when people come together in a Murakami novel, they are still alone. The lonliness that permeates his books runs strongly through this one too. Most characters can deal with and accept that loneliness. It's a part of their lives and identity. Even though they live in one of the most densely populated cities in the world, they are ultimately alone inside their own heads. Relief comes in brief moments when one person connects with another, knowing that connection is still going to be brief. It may sound like it's a depressing book. To an extent it is. But it's not a book that leaves a dark cloud over my head. I thoroughly enjoy this walk we took one night through these characters' lives. That opportunity we get to walk that line and peer through the veil reminds us of the beauty that can be found on this side -- and at the same time, how fragile it is. If you want to read a good mystery or simple story, don't read this. It doesn't have the tightness of story to satisfy. If, instead, you want to journey with the characters as they go through the night, this is a great book. If you simply love the night, this is a good book to read. Of course Murakami fans should definitely read it. The shift from first to third person alone makes it interesting. But most importantly, read it because you love the language. Read it because you love the sensuous use of words that you could lazily swim in. Read it for it's vivid descriptions and how much life Murakami can bring to a character in just a paragraph or two. Read it because the writing is just beautiful. The GF and I have have strict roles in our relationship. I lift the heavy things, do the driving, and kill the spiders (though sometimes I just deport them to the outdoors -- shhhhhhhhh). Somehow or other we've fallen into this 1950s dynamic. I'm not sure how or when that happened. I was reminded of this today out on the deck. She was lounging, reading her book and I brought some stuff up to the grill to make my lunch (she had awesome leftover Thai-style Cantonese food for lunch). I planned to have brats, Kraft singles, fresh tomatoes, and pesto on hogie rolls. Tongs in hand, I dopped the meat on the grill. I looked up and the GF was standing right next to me waiting for the tongs, And a bit puzzled that she felt the need to be there. Without even thinking about it she wanted to take over the grill from me. I was trespassing in her area. It's better for my ego that way. Satire is best when your not sure at first if it is satire. But what if you are convinced it's satire and then -- just maybe -- it's actually real? Yes. That is the Snuggie for Dogs. You may recall the original Snuggie. It dominated the night time airwaves a few months back. It's a blanket with sleeves. It's a great purchase for the person who can't figure out how to wear their robe backwards. I guess I can see the appeal, though. The commercials do make it sounds compelling. But now someone may have actually made a blanket with sleeves for dogs. When I started watching this, I thought it was a great satire of the commercial for the regular Snuggie. But now I'm not so sure. The order form and other links look legit. I'm afraid -- so very afraid -- that this might actually be real. Please, restore my faith in humanity and tell me this is fake. Or at least that he product bombed. Because I don't know if I want to live in a world where the Snuggie for Dogs qualifies as a million dollar idea. I just got into "The Closer" last year. And it's a shame to think the show may be on its way out. 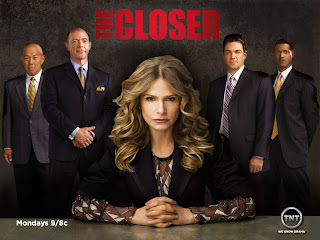 Kyra Sedgwick plays Chief Brenda Leigh Johnson of the LAPD, and recent Atlanta transplant. The character's commanding presence lurks just beneath her slight frame, gentle accent, and unerring politeness. Underestimated by many, Johnson control her squad with a tight grip. I like how the squad is a mix of people with different levels of experience and skill. Johnson job is not just to find criminals. She's also a manager. She has to deal with budgets, employee development, discipline, and the other miscellaneous stuff that goes along with being a boss. It's the stuff that most shows skip over and is refreshing to see. We also get to see Johnson as flawed (or normal) person. She struggles with her own personal issues at home and her compulsive snacking. She spends most of her day slightly overwhelmed, but gets through it with determination and tight focus on what she needs to do. The other members of the cast are great too, but the one that really struck me was G. W. Bailey who play Lt. Provenza. He seemed familiar, but I just thought it was because he was playing the close-to-retirement-cop archetype. It turns out Bailey was also part of the M*A*S*H ensemble. He play Sgt Rizzo of the 4077th motor pool. Nice to seem him get promoted. So why do I say the show is on it's way out? Charlie/Charlene. This character joins this rather dubious list. Like many shows before, The Closer has added a new kid to the cast to bring in additional story lines. Since it is a drama, The Closer may escape the dreaded Oliver effect, but seeing this new kid on the show makes me very nervous. Similes are, of course, comparisons using "like" or "as." The point of these comparisons or analogies is to help the listener understand a new concept buy referencing another one. But they are culturally dependent. And sometimes utterly useless. During a story on singing street vendors in Cuba, they interviewed a woman who sells Tamales from a cart. You can add shredded tamale to birthday cake? You get tamales from tall trees? Tamales play a prominent role in cartoon violence? Tamales are used euphemistically to describe women's physiques? If you have a Professor nearby, you can convert tamales into radio parts? How exactly are tamale's like coconuts? They spoil easily. I don't stop doing my pregon until I have sold everything because I will not try to sell the leftover tamales the next day. Hm. Coconuts spoil easily? Is this something I should already know? It's not on my syllabus. It's easy to forget how culturally specific our analogies and references can be. It's something I need to keep in mind for my own presentations. You can read/listen to the story here. I saw this on Youtube tonight, and I've been going back on forth on whether it's awesome or a complete waste of my time. I think it might be both. This collection of Star Trek TOS bloopers, unused scenes, odds and ends came to me without sound in the first place. If somebody has a copy with the original audio track or any information whether an audio track exists at all, I would be thrilled to hear from you. Because watching the raw footage without sound struck me as a bit dull, I added some hopefully passable music. The first clip uses the Chariots of Fire theme. The second uses Austin Powers. The clips aren't so much a bloopper reel as the are a behind the scenes glimpse at the making of Star Trek. A couple days ago I described a dining experience at a Red Lobster. Those opposed to chain, casual dining may be appalled at the very idea of going there. Why would I, a fan of Food Network go there? Their cheesey, garlicy biscuits are warm and crumbly and fill with some mad scientist's updated version of heroin. They feel good and they taste event better. I could go there and just eat bowl after bowl of this dense, yet fluffy goodness. They should just drain the lobster tank, and send back the shrimp. They don't need any of that stuff. Just the biscuits. You know what's even better? The biscuits are FREE! Well, not quite, but they come with your meal. You get an unlimited number of these golden nuggets of taste. When my entree does come, I try to pace myself. I don't want to fill up on linguine or scampi when there are biscuits begging to be consumed. At Red Lobster it's all about the biscuits for me. They can skip the seafood. Well, maybe not entirely the biscuit. It's 90% about the biscuit, 9% about the Caesar Salad (surprisingly awesome) and 1% about the shrimp. I'd say you could skip the meat and just gorge on biscuits and salad and call it a vegetarian meal, but I don't know what they put in those biscuits. They may have made them using unicorn stock or something similar. Or pork fat, which we know makes everything better. When I encounter something that tastes really good, I just assume pork fat is involved in some way. They should just do what their sister chain Olive Garden does (both companies are owned by Darden Foods) who offers a Soup, Salads, and Breadsticks option on its menu. Red Lobster should just have an option on the dinner menu for unlimited biscuits, Caesar Salad, and chowder. Okay, I don't really care about chowder. The line just felt like it needed a third item. I'd been thinking of going to Red Lobster for about a week. Then I read this discussion thread on Fark. And I had to have my biscuits. The discussion stared with an article comparing the likely diets and hunting styles of Neanderthals and Homo sapiens. It quickly transitioned into a discussion on the nature of species interbreeding, some commentary on creationism, early human habitat, casual dining, and, of course, biscuits. I sometimes wonder why I read Fark. It can be a huge time sink. But then I see a bizarre threads like this one. Yes, much of the material is juvenile. And much of it will offend many people for any number of reasons. But there are some intelligent posts in the discussion threads. I sometimes learn things. It's pretty easy to make a decent approximation of those biscuits yourself, you know. It's just baking mix with some cheese mixed in and brushed with a mixture of melted butter and garlic powder. Yes, but making them at home just isn't the same. At Red Lobster, you can chew the doughy goodness and close your eyes and almost hear, in the back of your mind, the distant clang of the lighthouse bell and low moan of the trawler's foghorn. Then you can cross the parking lot and go into the Olive Garden and finish off the experience with a lovely Rocca delle Macie Rubizzo. At home, you're just stuck with a doughy, cheesy mixing bowl and the dusty echoes of your lone footsteps pacing through the kitchen. So there we go -- a post with four things I like. Outdoor space is great for things other than plants. On Saturday, The GF soaked about 6 pounds of chicken breast (I stocked up at a sale) in a marinade that featured Rosemary from the garden, and other assorted kitchen magic and then threw them on the grill. It was a feast for all five senses. The smell from rapidly cooking chicken and billow of smoke was fantastic. The sizzle of meat on hot metal is something you don't get with the microwave. The flames that burst forth from the gas grill were awesome. The propane canister got really cold as we got towards the end. And, of course, the taste was fantastic when served with a salad that included fresh Tomatoes, Basil, and parsley. Here's a boring video where meat meets metal. How do I know Skype is now a mainstream product that reaches beyond the early adopters? The 419 Scammers have arrived. I am Barr. Morris Williams, a solicitor at law, I am the personal attorney to Engineer Frank Shaikh a national of your country, who worked with Shevron Development Company here in London United Kingdom hereinafter referred to as my client. On the 21st of April 2007, my client, his wife and their children were involved in a plane crash while arriving from Easter Holiday to Soctland. All occupants unfortunately lost their lives. Since then I have made several enquiries to your Embassy to locate any of my client's extended relatives but this has proved unsuccessful. I came across your name and contact on internet, while I was searching for Frank 's relations. Since my search was unsuccessful, I decided to contact you for this project. I am contacting you to assist in repatriating the money and properties left behind by my client before the Government and the Finance House where these funds were deposited confiscate or declare it unserviceable. Particularly, the finance house where the deceased deposited as family treasure, a consignment valued USD12 Million, earlie this year issued me a 12 months notice to provide the Next of Kin or have the fund consignment confiscated, and this ultimatum expires by next month. for expenses and tax. He made the money in one of his Pan Euro- African Oil Development deals he had with one of the Pan Euro- African Oil Development Marchant. I also have all necessary legal documents that can be used to back up any claim we may make. All I require is your honest co-operation to enable us see this business through. I guarantee that this will be executed under a legitimate arrangement that will protect you from any breach of the law. As we proceed you will begin to realise that it is risk free.Only i have to instruct you on what and what to do at everytime. Get in touch with me on my private e-mail address (morris.williams.law@gmail.com) so we can proceed. The other night at dinner I was reading my book, when the lady at the table across from me asked about my Jambalaya. I gave a pleasant, positive review and went back to reading, while she went back to talking to the guy she was dining with. Later on, there was some police activity in the parking lot. Apparently 18 motorists had called 911 about a drunk driver on the road. Seven police cars showed up and pulled him over in the parking lot. The couple starts chatting with the waitress about this and conversation turns to the off duty cop the restaurant often has on site (note to self: choose a different restaurant next time). That cop mainly deals with disorderly drunks or people skipping out on their checks. The three folks joke about making customers wash dishes. The waitress brings their check later and then steps away. The male then gets my attention, explains that they are over the road truck drivers who get paid the following day, and they are short on the bill today. He asks me for $15 to cover them. I say, "Sorry," and turn back to my book. This does not sound like the kind of thing I want to get involved with. After all, everyone's running scam, right? If you know you don't have the money because payday is the next day, why go out to dinner? I sit there reading and thinking about this. Maybe I'm letting my inner New Yorker get the better of me. Maybe these folks really did miscalculate their costs and are in a spot. I began to wonder if I did the right thing. I didn't seriously consider changing my mind, but I felt a little guilty to have just dismissed them. After a couple minutes, I heard the woman tell the man, "Well, I'll just put it on the debit card." And he came up with dollar coins for the tip. So, obviously, they had the money. On the one hand, my well honed sense of cynicism made the right call. So that make me smile. On the other, this situation is even more disgusting than if they had no money and went out to eat planning to skip out on the check. They actually had the money, but they weren't willing to spend theirs. They thought the better solution was to beg some stranger at another table with a made up story. Regardless, they paid and left. And everyone was happier, despite feeling a little dirtier, at the way the evening turned out. Tuesday I committed heresy and skipped the microwave for lunch. Instead, I raided the garden. I picked a few tomatoes and basil leaves. I then combined that with some Pesto the GF made last week from a bag full of the Basil I grew, added mozzarella balls from Costco, put is all on a Hoagie roll and had some great sandwiches that started falling apart as soon as I picked them up. But I still had more tomato slices. So I dropped them in a bowl, added some more mozzarella, some basil, splashed on some Balsamic, and had a great little salad. This is why I go through the hassles of gardening. 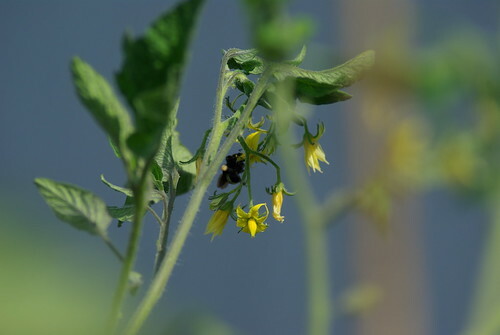 So I can go out to my deck and grab some food that I grew from a tiny seed. A couple weeks back I mentioned by travel adventures trying to get to Savannah, and I mentioned and odd hotel room. It was at the Hilton Garden Inn. They were pretty full by the time I got there, and they had two rooms choice left for me. One had recently been a smoking room, and one doubled as a hopitality suite. I wasn't entirely sure what that meant, but it seemed like the better option anyway. A hospitality suite is generally for receptions or other casual events that make it a more comfortable alternative to spending more time in the conference room across the hall. That means it is a large open space with a concrete floor under the carpet. And a Murphy bed that flips down from the wall. Now, I'm not complaining. The staff as great, and the room was reasonably comfortable. And I found it way more amusing than I probably should have. And the door to my room was only 10 feet from the door to the meeting I was going to the next day. His eyes were watching the Emperor carefully, as though to see how far he might go on his own. "Still, if that be so, one could have any person make the prophecy." There is a big hole in my Science Fiction reading. I have read very little Asimov. It's time to start changing that and get back to the original cannon. Prelude to Foundation, by Isaac Asimov is the fist book in the Foundation series, the second to last one written in the Foundation series, and, according to Wikipedia, the 9 book in the Asimov Foundation universe. The Foundation novels began as short stories in the 40s, became a trilogy of novels in the 50s, and expanded beyond that through the rest of the century. If you would like to know more about the way the Foundation novels were written, you can get an overview here. Prelude to Foundation is an intellectual novel. It is a story less about characters and plot, and more about ideas and concepts. There's some suspense, sure, and I wanted to know what happened next. But I didn't feel a visceral connection to the fate of the characters. Knowing a little bit about where the series is going made the characters a bit larger than life - historical heroes, rather than normal people struggling against the odds. The story takes place in the Galactic Empire, thousands of years in the future. Humanity populates hundreds of thousands of worlds, and Earth is merely a legend few people have heard about. The novel opens with the Emperor discussing things with his top aid, and conversation turns to the topic of a mathematician. It can only predict major changes. It requires huge amounts of input data. It's creator doesn't believe it's possible. The Emperor wants it to predict his future. Seldon explains it won't work. Chetter Hummin, a reporter, convinces Seldon that he now needs to flee the Emperor and hide in the sub-societies of the Empire's home world. Thus we get a chase novel that visits strikingly distant societies while Seldon pushes the boundaries of law and tradition to determine if his psychohistory might really be possible. The story and plot appealed to my intellectual curiosity, which makes it quite different from a lot of the other novels I read. In that respect, Asimov is the complete opposite ofHaruki Murakami. Normally I write these review a week or two after reading the book. In this case it's been about a month and a half. While I did mark a number of interesting passages at the time, they've become more interesting to me as their context has started to fade. Asimov says a lot of things about human nature and modern society. And he uses different anecdotes within the novel to symbolize the broader direction the novel is going. And sometimes he gets too blunt with that. "What can we do? We test constantly for any mutations that may spring up, any new viruses that may appear, any accidental contamination or alteration of the environment. It rarely happens that we detect anything wrong, but if we do, we take drastic action. The result is that bad years are very few and even bad years affect only fractional bits here and there. The worst year we've ever had fell short of the average by only 12 percent—though that was enough to produce hardship. The trouble is that even the most careful forethought and the most cleverly designed computer programs can't always predict what is essentially unpredictable." The last sentence of the first paragraph makes the point perfectly clear. We don't actually need the parenthetical expression. The central problem that Seldon encounters is that he is trying to build a model of the entire universe, but the sheer scale of it makes it nearly impossible. It's like when Steven Wright talks about having a map that's 1:1 scale. He can't figure out how to fold it. "In other words, you can't get any picture of the Universe as a whole except by studying the entire Universe. It has been shown also that if one attempts to substitute simulations of a small part of the Universe, then another small part, then another small part, and so on, intending to put them all together to form a total picture of the Universe, one would find that there are an infinite number of such part simulations. It would therefore take an infinite time to understand the Universe in full and that is just another way of saying that it is impossible to gain all the knowledge there is." Seldon's background is in math, and while it's a powerful field, understanding the future requires understanding the past. So early on Hummin pairs Seldon up with with Dors, a historian, both to protect him, and to help him develop his theories. While he might understand numbers, she has the broader understanding of how politics work and societies evolve. That's what holds the Empire together. The Outworlds are also less restive when a noticeable portion of the administrators who represent the Imperial government are their own people by birth and upbringing." Seldon felt embarrassed again. This was something he had never given any thought to. He wondered if anyone could be a truly great mathematician if mathematics was all he knew. He said, "Is this common knowledge?" "I suppose it isn't," said Dors after some thought. "There's so much knowledge to be had that specialists cling to their specialties as a shield against having to know anything about anything else. They avoid being drowned." This is one of the things I find compelling about this novel. Even though he sometimes does hit the reader over the head with the symbolism, Asimov still includes great commentary on how our own society works. That last paragraph itself is an interesting commentary on the challenges of information overload in our own digital age, while the first is great description of the importance of parceling out political jobs to a diverse group of supporters. Asimov comments on how the most beautiful things in the world are, by their very nature temporary. He uses a description of some wonderful snacks to illustrate the point. She was right. He tried to have the dainty linger in his mouth; he tried licking it carefully; tried biting off a piece. However, the most careful lick destroyed it. When a bit was crunched off a piece, the rest of it disappeared at once. And each taste was undefinable and not quite like the one before. "The only trouble is," said the Sister happily, "that every once in a while you have a very unusual one and you never forget it, but you never have it again either. I had one when I was nine --" Her expression suddenly lost its excitement and she said, "it's a good thing. It teaches you the evanescence of things of the world." One of my favorite passages describes Seldon's thought process when lost in the wilderness. Staying still was not an option. If he was facing the wrong direction, there was a chance that light would be visible right or left—and it wasn't. If he had followed the wrong crease, there was no possible way he could return to the copse and locate a different crease. His only chance lay in the assumption that he was facing the right direction and that the meteorological station was more or less directly ahead of him, but that the meteorologists had gone and had left it in darkness. Move forward, then. The chances of success might be small, but it was the only chance he had. Many times in life people spend time trying to figure out the best way to go. Choosing the best course of action, or the best path to follow, isn't nearly as important as moving in a "good enough" direction. Of course if you're actually lost in the woods, staying put is probably the best practice. This is where the metaphorical woods diverges from the literal. If ever you find your self lost in the metaphorical woods, it's best to make a guess about the right direction and to just move forward. Rescuers will find us in the literal woods; the only ones who can rescue us from the metaphorical woods is ourselves. And then there are moments in the book that make me think the Matt Groening was an Asimov fan. "The robot you see near the center was, according to tradition, named Bendar and served twenty-two years, according to the ancient records, before being replaced." Prelude to Foundation is an interesting and long book. If you are a science fiction fan you have probably already read Asimov or you probably should. His influence on the genre is profound, and Prelude to Foundation is a great place to begin exploring that influence. It's a mid-80, thin, pre-Costanza Jason Alexander singing and dancing while extolling the virtues of this awesome and too short lived McDonald's sandwich. And I think, "Keep the hot side hot, and cool side cool" is one of the best tips for living your life to come out of a fast food commercial. This post will cover three of the Blog marketing resources that I use and the traffic that I get. I'll talk a little bit about how they work, and spend most of my time on Adgitize, because I actually make money with Adgitize. If you would like to start using Adgitize and start generating revenue from very little work, you can sign up here. Or you can sign up by clicking the Adgitize logo above. (Note:these are my affiliate links, and if you use them, I will make a few bucks). You won't get rich on the program, but it's a nice way to get a few dollars in Pay Pal. But Adgitize isn't just a tool for generating cash; it can also generate traffic. But you are probably wondering about the cash. In May, I added Adgitize ads to my blog and made $2.23 between May 23 and May 31. In June, I began running my ad on the network. That costs $14/month. I made $18.34 -- a $4.34 profit. In July, I did the same thing and made $16.52 -- a $2.52 profit. 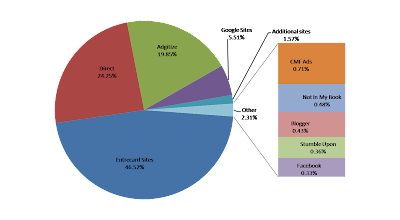 In addition to the small profit, Adgitize also drives 15%-20% of my traffic. Each month, my top traffic source has been Entrecard. Cromely's World has been in the top 15 most popular blogs on Entrecard for the past several months, and has spent most of the last two months in the top 5. Direct traffic is another big category. That could include people getting here by clicking in their favorites folder, typing in my URL, or getting here some other way without a link. It could also inlcude other search engines or Entrecard hits that just don't show up in Google Analytics for whatever reason. The other big traffic source in July was Stumble Upon, primarily because of my post about a hotel in SC. While the other sites provide fairly steady traffic, Stumble Upon traffic is often a surprising bonus. CMF Ads is another advertising network. It sends me a realtively small amount of traffic, but considering I put very little effort into it, I'm okay with that. I can likely increase my traffic from CMF by being a more active participant in their forums, instead of the lurker I am. There are some great people in the network, so I'm happy to be part of it. Entrecard allows members to earn credits by clicking on the Entrecard widget on other blogs (up to 300/day) and to earn credits by hosting an Entrecard widget on their own blog. Users also earn credits when someone clicks on the widget on their own blog. Users buy ads on other Entrecard members' blogs by spending the credits they earned. The advantages are that it's free to participate and people will visit your blog just to earn their credit. Users can also see who has visited their blog and clicked on the widget, so they can "return the drop" by visiting that other blogger's site and clicking on the widget there. The disadvantages are that all that clicking (or dropping) and loading web pages can take a bit of time. Also, some people deride the traffic as "junk" because people are coming just for the credit. I disagree with that view, but it is a legitimate argument. It's also a topic for another post. You earn money based on how many points you earn each day. Users who host ads can have multiple Adgitize ads running on their blog at one time. The more ads that a blogger runs, the more points that blogger earns. I run a total of 9 ads on my blog for Adgitize sites. And the ads change each time you load the page. Becuse I run 9 ads, that means for every page view I get, I get 9 ad views. The advertising system is different from Entrecard. In Entrecard, only 1 ad runs for an entire day, and a blogger can host only one Entrecard widget. Plus, you get to approve or reject each ad individually. In Adgitize, multiple ads run throughout the day and there is no interaction between the advertiser and the blogger. Bloggers do not approve ads in advance. However, they do have the option to manually reject ads and prevent them from showing up in the future. So it's a different philosophy of running ads. The other similarity is in "Clicking" Entrecard users get credits for each site they visit that has the Entrecard widget (up to 300/day). Adgitize users get points for each Adgitize ad they click on (up to 100/day or 50/day). On Adgitize, if you are a paying advertiser ($14/month) you only have to click on 50 ads to get your 100 points a day. If you are not a paying advertiser, you have to click on 100 sites. The key difference (besides the volume of clicks) between the two approaches, is what you click on. When a visitor comes to my site to get their Entrecard credit, they do it by clicking on the Entrecard widget in my side bar. When they come to my site to get their Adgitize points, they click on a Adgitize ad, which opens a new tab or browser window with that new site. So the new site defiintely gets traffic. The other difference in a level of anonymity. When an Entrecard member clicks the widget on my blog, I know who they are. It shows up in my Inbox so I can then go visit and click on their site. I have no way of knowing who in the Adgitize network clicks on my site. There are advantage and disadvantages to both those approaches. On Entrecard, you can get in the habbit of doing mutal clicks which means you visit a lower variety of sites. Also, that daily click becomes an informal currency. On Adgitize, I seem a wider array of blogs, but I don't know who my regular visitors are. 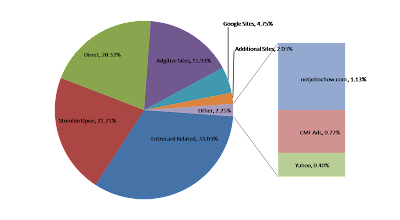 The other challenge with Entrecard is the volume of sites involved. Visiting 300 sites in a day means spending less time on each site than when you are just trying to visit 50 sites a day. If you already use Entrecard, why would you want to ad Adgitize to the mix? It seems like in addition to the 300 drops you might try to make on Entrecard each day, Adgitize is now asking for 100 (or 50) more. Here's the trick -- many Entrecard users are also Adgitize users. So if you participate in both networks, you can come to Cromely's World, read my post, maybe make a comments, click on my Entrecard widget, and then also click on one of my Adgitize ads to be taken to another site. Adding those Adgitize clicks doesn't result in any significant increase in time or work. And the ability to cut the number or clicks you need to do in half by becoming an advertiser makes it even easier. If you don't want to do anything other than write your content, just become an advertiser and put the widget on your site. Unlike Entrecard, the amount of clicking you do has nothing to do with how much traffic the site will bring you. Without clicking, you may not make as much money on the system, and you may not even clear your $14 ad cost, but you will definitely subsidize it by just being an advertiser, producing frequent posts, and hosting ads. If you put both the Entrecard and Adgitize widgets on your blog, you also increase your traffic because those who participate in both networks will have an added incentive to come to your site. Success in the Entrecard program requires more effort. Success in the Adgitize program requires good blogging habbits, being an advertiser, and bringing in outside traffic. CMF Ads is a little different from the other two. In CMF Ads, there is no clicking involved. You simply host ads and buy ads. You can purchase ads in the system with cash you bring to the system, or with cash you earn within the system. When I started with CMF it was just by hosting ads. People within the network could choose to purchase an ad in my rotation. Each ad ran for a month. Multiple ads can run simultaneously. After a month, I had enough cash in the program to start buying ads on other sites. It generates a little bit of traffic, but that traffic requires zero effort on my part. Success in the program, and increasing my earnings requires, that I increase my traffic. The more ads I sell (and have rotating through the three slots I make available) the more money I make. A key metric advertisers look at is the cost per impression. To make that number look better, I can either lower my monthly cost (currently $.50 through the CMF network) or increase the number of impressions. Increasing the number of impressions means increasing the amount of traffic I get to Cromely's World. And how to do I increase traffic? Through advertising on Adgitize, advertising on Entrecard blogs, and visiting Entrecard blogs. How do I earn more points in Adgitize? By generating traffic through the Entrecard program and by bring in more traffic through my ads on CMF, which I can buy because more people buy ads on my site through CMF. How do I increase my traffic on Entrecard? By being an active participant, and hosting an Adgitize widget which encourages Adgitize/Entrecard members to visit my site. The three systems work well together, and I'm happy to participate in all three. Stumble Upon is the big wild card. My Stumble traffic from July decreased my cost/impression in CMF Ads, and the extra ad/page views gave me more points in Adgitize. Right now, I'm dependent on having sites "stumbled" by the right power users to generate those big spikes in traffic. My network isn't big enough yet. But it's getting there. My Stumble page is here. I may have rambled a bit comparing and contrasting programs, but because of their differences, they work well together. Today while waiting for my plane to reach the magic 10,000 feet, I did some of my back reading in Scientific American. I was a little surprised when they were talking about what the next President should do. I thought, "Have they given up on Obama already?!" Then I realized I was reading the May 2008 issue. Regardless, they reported a sleep study that may have shown that a 6 minute nap has a significant, positive impact on memory. This study, like many others, reinforces the idea that sleep is not a time for the brain to shut down. Rather, it is a time for the brain to engage in alternate information processing tasks when it's not distracted by things like the conscious world. Not everyone agrees, and the article does cite some skeptics of the study. It's a reasonably short article and accessible to the non-scientist reader. You can see the whole thing here. In the current issue of Fast Company, they have a fascinating article about the Micro Grid. It's focused on small, local power generation technologies -- things life roof top solar, home based wind power, smart meters and related technologies. Increased use of the local, small scale power generation means there is less need for large, cross country power transmission lines and less reliance on on more carbon hungry large scale power plants. It seems like a great idea in theory, but we have heard plenty of stories arguing it's not a viable solution because of cost, scale, home owners associations, etc. But one thing I hadn't heard about before was the active opposition of traditional utilities worried about losing business. Ed Legge of the Edison Electric Institute, the lobbying organization for the utility industry (and leader of the national effort to oppose federal renewables targets), is surprisingly frank on this point: "We're probably not going to be in favor of anything that shrinks our business. All investor-owned utilities are built on the central-generation model that Thomas Edison came up with: You have a big power plant and you move it and then distribute it. Distributed generation is taking that out of the picture -- it's local." This attitude is understandable. After all, if utilities don't own it, they can't bill for it. And with close relationships between power companies and state regulators, they can and do throw up a variety of roadblocks to see that rooftop-solar programs and the like remain tiny. The tactics utilities deploy to protect their profits can make a reasonable person's head spin. "In Arizona a couple of years ago, we got a renewables incentive passed," says Adam Browning, executive director of Vote Solar, a national advocacy group. "A local utility proposed that it collect money for all the electricity that you didn't buy from it. The argument was: We've got fixed costs associated with maintaining the transmission and distribution grid. So if you don't buy from us, we want to charge you for your 'fair share' anyway," which it reckoned as everything but the avoided fuel costs -- the oil that you don't burn by choosing renewables. So regular customers would pay 11 cents a kilowatt-hour, but customers with solar panels on their roofs -- not even using the utility -- would still have to pay 6.8 cents an hour. "We hired a lawyer contesting this, and eventually we won," says Browning. Today, Arizona has decent, though not finalized, net-metering rules. Jim Rogers, Duke Energy's CEO, told Fast Company he's a fan of putting solar panels on his customers' homes and businesses -- he just thinks Duke should own them. "I believe at the end of the day, we'll be able to do it cheaper and better than everybody else." But Urlaub says, "We know that's not true," pointing out that Duke recently submitted a public bid for a utility-owned 20-megawatt rooftop-solar program and came in higher than several independent, nonutility solar companies. There are more stories in the article. Utilities are trying to prohibit private generation and local energy project that threaten their business. Or they are trying to use the law and Public Utility Commission to make it cost prohibitive. Instead of encouraging entrepreneurship, innovation, new business, and job creations, they are putting up road blocks to progress. Now, I don't expect the private ones to aid local power generation (though incentives for them to buy power from private generators might be a could idea). But to actually use the law to prevent these types of projects is disgusting. We need a new approach to the grid -- one that blends local, micro generation with large plants and utilities. One that uses a combination or resources -- some clean coal, some nuclear, some hydro, some wind, some geo-thermal, etc. New innovations in battery technology and power storage should round out our electrical plan. It's a fascinating article and well worth the read. Fan of Anthony Bourdain? Not a fan of Sandra Lee? Check out this awesome story of their recent encounter from a link The GF sent me. The next morning, I'm still trying to reconstruct the exact progression, the details, like trying to remember the license plate of the truck that hit me. Only this wasn't any normal truck. This was far more terrifying and traumatic an event than being smashed by the grill of a Peterbilt, pulled up into the wheel well, dragged for a while, only to have my shredded remnants left by the side of the road, wondering, in my last moments of consciousness, "What the hell happened?" I'm pretty sure, judging by the vestigial ectoplasm on my jacket that I was sideswiped by pure evil. In addition to his strong food cred, Bourdain is also a great writer. The comments are also fantastic. The Port of Seattle completed renovations on a terminal to accommodate container ships. Container terminals need cranes. Cranes need power. And because a contractor screwed up, the power cables don't fit. A small mistake at the Port of Seattle is going to cost a lot, perhaps about $1 million. The problem is 2/100ths of an inch, and it delayed the opening of a celebrated project by two months. The Port constructed a new cargo terminal on the Seattle waterfront and dug a trench to hold the electrical cable for cranes that lift containers from ships. The new trench, built by contractor BergerABAM, is narrower than it should be, so the cable doesn't fit. "Clearly the contractor should've built the trench at 2.52 inches and it's 2.5," said Port Commission President Bill Bryant. What I don't get is why this is going to cost the Port of Seattle anything. It seems that the contractor screwed up, and the contractor should therefore pay for its mistake. While the article goes on to say the Port will be discussing the issue at a meeting, it seems they should take the initial position at least, that the contractor should be on the hook. Unless the Port screwed up a the specs (a detail absent from the article). The whole things just seems kind of silly to me. Half Blood Prince is a good, solid movie. My perceptions of it may be impacted by some distractions I had in the last 45 minutes, but for fans of the series, it is definitely worth seeing. I saw it in 3D at the local Imax. Only the first 10 minutes or so of the movie was in 3D so it seemed more gimmicky than anything else. The effects were technically well done, but they didn't add anything to the movie (unlike the effective use of the 3D in The Order of the Phoenix). Before I go, let me warn you that there will be spoilers here. The book has been out for years, and the movie out for weeks, so if you are trying to avoid spoilers, you probably aren't reading reviews, anyway. The movie stays faithful to book, but does make some changes. The opening sequence is actually something that happens in the next book, but it works. In fact, most of the changes they make really do make the story better -- at least for this format. The movie spends more time on Draco and the vanishing cabinet as he experiments with it. I don't recall so much attention on it in the book. For a key plot element, the visual story telling works out well. The confrontation in the clock tower where Snape kills Dumbledore works better, too. It seems less contrived than the book version (which involved a paralyzing spell and a invisibility cloak) and just feels like it works better. It plays well to Snape's "betrayal." The do cut nearly all of Tom Riddle's back story. We don't see anything about his family. We just get to see him in the orphanage briefly. It's an important and lengthy aspect of the book, and it really helps us learn more about the path to Voldemort and what is involved in becoming truly evil. And those elements are important to the Horcrux strories in this book and the next. Without the indepth stories, why does Dumbledore take Harry to the cave? At the same time, I'm not sure how they could have covered all that material and still made a compelling movie. The movie (like the book) is filled with teen romance and angst. I'm torn about its role here. After all, we are dealing with teenagers (even if they are are fighting for the fate of the world) and problems they have do ring true. Of course they handle these matters immaturely, but in an age appropriate manner, especially given their romantic experiences. It also takes up a larger portion of the movie than it does the book, but that's largely because so much of the exposition and history in the book distracts from this stuff. But in the movie, the romance is right up front. They actors do a good job with their role. After all these years, they should. Jim Broadbent is new to the series in his role as Professor Slughorn and humanizes him well as a man trying to deal with his past shame. Broadbent makes Slughorn a real person. Evanna Lynch does an amazing job with her role as Luna Lovegood, and is sadly underutilized in this movie. She brings the subtle insanity to the screen that the role demands, playing a character that seems perfectly harmless, while at the same time being that last person you want to encounter in a bar fight. Overall, this is a worthy addition to the franchise. It takes a different path from the book because it is a different medium and the changes work. 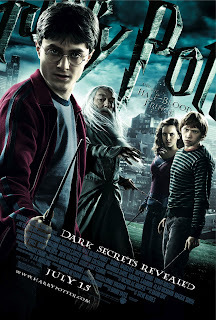 The movie is not as strong at The Order of the Phoenix, but I attribute that to its role in the broader story arc. Harry Potter fans should definitely see this movie. Those new to the franchise may want to start elsewhere. You can find more of my Movie Reviews here. I got this email today. I imagine others have too. It allegedly comes from "refunds@irs.gov. "But beware. THIS IS A SCAM! After the last annual calculations of your fiscal activity, we have determined that you are eligible to receive a tax refund of 1527.29 USD. Please submit the tax refund request and allow 6-9 days in order to process it. The was a hyperlink that would go to at eecu.net. Again, if you get one of these, it is a scam. How can I tell it's a scam? First of all, the IRS will never contact you by email to offer you a refund. They will use regular mail. Second, while the mail is mostly grammatically correct, The lack of a dollar sign on the amount is suspicious. If you would like more information about phishing attempts and scam emails pretending to be from the IRS, please visit this page on the IRS web site. Or if I've scared you away from clicking links, go directly to the IRS websites at IRS.gov. You'll see a link called "Report Phishing" in the upper right hand corner. There's some great information there. Apparently I'm making honey someplace. I just have no idea where. 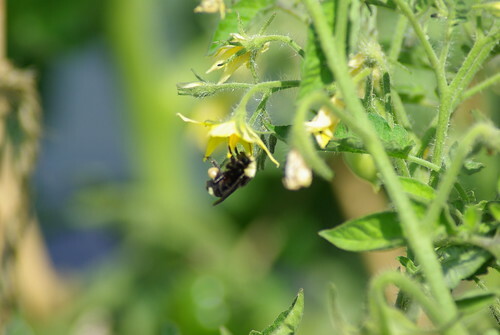 This little guy has been buzzing around my blossoming plants for a few days. 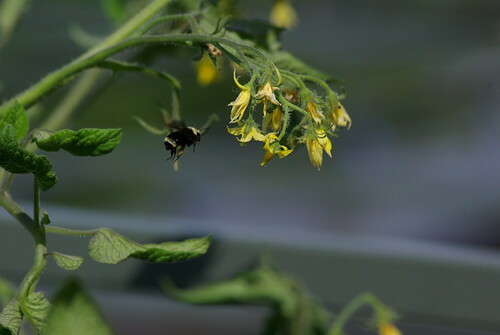 I wonder what Tomato-Thyme-Lavender honey tastes like. Oh, and Honey Dude (or Dudeette) -- you're welcome.